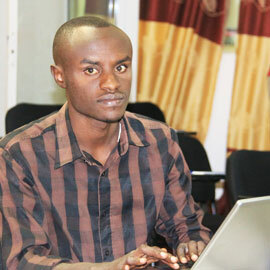 Pacifique is a final year medical student at Bujumbura Medical School and the chief of innovation and finance assistant at Village health Action, a non-profit and youth-led organization based in Burundi that he joined in its early days in 2012 when he was entering medical school. He is also the coordinator in charge of youth empowerment at English Medical center (E.M.C. ), a center of excellence designed to empower youth in various vocational skills like ICTs and English. Joining English medical center in 2013 he was quickly identified as one of the promising young medical student and was appointed as the project liaison officer at EMC, a role that he carried out with excellence and two years later he was appointed as the coordinator in charge of youth empowerment, a role that stays his actually at the same center. English medical center is where Pacifique developed mostly skills in volunteerism and project management, he piloted the project of extending the work of EMC in various universities like HOPE AFRICA University and Université Lumière de Bujumbura .The big project he is working on actually is the one aiming at empowering health care providers in Burundi in medical English and he is part of the teaching team, a volunteerism activity he does on weekly basis. Pacifique loves learning and acquiring new skills and his aim once he ends general medicine is to specialize himself in the management of chronic conditions essentially diabetes. Pacifique’s quality is working in teams; he is parts of different organizations promoting public health. Pacifique, in his free time, listens to country music. He is a football fan and his favorite team is fc Barcelona and he has even a specific facebook page dedicated to his favorite team that he animates daily. The page has more than twenty thousand of likes for the time being.